This card is better for Rogue than Warrior. Combo with Upgrade! to get something secret that Blizzard really wanted to push with this expansion. What was it again? Oh yeah, a playable Poisoned Blade. t6: Captain Greenskin, enough weapon damage to kill. Something like that. Okay, it can be removed, but it slows opponent down, and that's okay too. Could this work in a gimmicky weapon warrior deck? 3 health really isn't much but this could be a really good card. Some great combo potential this card. that wolf and no charge so sad. this is more of a fitting image for warsong commneder. Warsong Commander is my bae don't you even. It's 5 mana to play this and activate your hero power! This is utter trash. Nuff said. I think this should be a 4/3, because at this point it's basically a 5 mana 3/3 that gives you two armor and one attack to your weapon. Which basically means you get a goblin auto barber, but that you're paying 3 mana extra for 1 toughness and two armor, which is pretty bad and quite slow. Only upside is that you can use it several times, assuming it lives more than one turn. 2/4 might have been better stat distribution. But as I said, if it was a 4/3 it'd probably not be THAT much better. I think that with the new taunt warrior upgrades, we can make it survive much longer than one turn. But is it still powerful enough though? 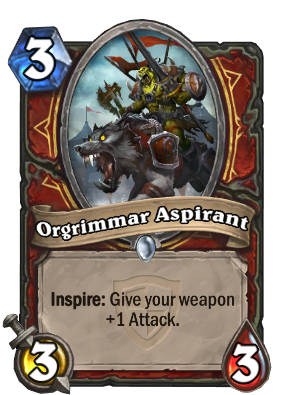 I mean, keeping it alive, paying two mana every time we want a higher attack on our weapon - is that worth it? Barely, if at all. In my weapons warrior, definitely. It lets me remove bigger minions, keeps my Gorehowl alive, and gets me to that lethal that much faster. Plus we still get that 2 armor (4 with Justicar Trueheart).